Sounds like some one broke a law or something, doesn’t it? Well, it’s almost like that, but also much like a foot rebelling against itself. 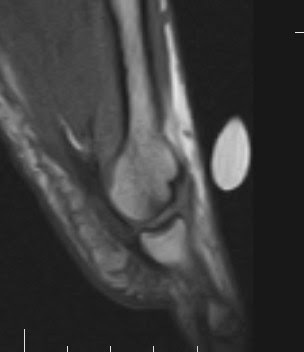 Insidious, slowly painful, destructive… AKA: avascular necrosis of the metatarsal head. Essentially, what happens is that the metatarsal head is destroyed from the top down, either by trauma from some outside source, or repetitively through the joint itself, and it’s slow to heal. Vascular supply in this area is sparse, so healing takes longer. MUCH longer. Longer than any typical runner takes between workouts. 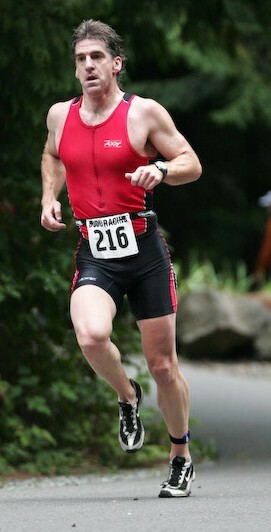 Here’s a picture of me from my last tri in 2007 (the last one I did before the surgery in 2008, photo by Image Arts Photography, September 2007), and you can see that I’m VERY calf-dominant. Pushing off the ball of my foot hard. I did this no matter what shoes I was in. Racing flats, training shoes, whatever. The pain started just at he base of my 2nd toe, but it wasn’t bad, wasn’t constant, and went away by my next run. It took about 4 months, but eventually it wasn’t going away, and then became constant. Funny thing is, it didn’t hurt WHILE I was running. Well, not for quite a while anyway. Once it started to hurt while I ran, I knew it was time to seek medical help. So I went to see a local podiatrist. He poked, prodded, took x-rays, sent me for MRIs, and put me in a boot to immobilize my foot. After 6 weeks, he took more x-rays, poked and prodded more, with the pain still there… He admitted he had no clue, suggested another podiatrist, and said I should consult with him and come back (yeah, like I was interested in coming back). See that notch on the upper side of the metatarsal? That’s the bone getting eaten away by my toe bones. That huge white thing above my foot is an almond taped to the top of my foot so they knew they were in the right area. So anyway, back to the symptoms happening on my right foot – I’d finally gotten to running at a slow pace early this year, built up some distance, did a sprint tri on Memorial Day… I was balancing my training, building up the strength in my ankles, but I also had to moderate my pace so that my right foot didn’t start feeling the same symptoms as my left did before surgery. I went for a couple months thinking that my running days would be numbered, even with just the limited run training I was doing. I did another tri, an Olympic distance this time, in September, and then went towards a more minimal shoe after that race. But the thing that was different about them was that the heel height was much lower, and the upper was flexible enough to allow my forefoot to spread out. What was the difference to my foot? Less toe flex, meaning my joint was staying straighter. My foot was landing flatter. And I was re-making my stride into something more hip- and hamstring-dominant, instead of calf-dominant. This went even further when I switched to Sacony Kinvaras. Since those changes, I haven’t had any symptoms in my right foot at all (where’s the wood to knock on?). It comes down to not having the toes flex so much, landing the foot as close to flat as possible, and keeping it that way. Will I get back down below 6 minute pace again? I don’t know. And really I don’t care. I’m glad to be running again at all. I’ve dropped from 10’s in January to between 7:45-8:15’s in training now. No idea what I’d do in a race now, but my Oly tri I averaged 7:45’s. That warning at the top? Yeah, I’d just say to the calf-dominant runners out there, maybe you’d want to rethink that stride, especially if you start feeling any pain at the base of your 2nd toe. I took today off work to get some other things done with Lisa. Ran with her last night -- she made 1.5 miles non-stop! This morning, I decided to run "long". Not a huge jump in miles, only about a mile longer than my recent long-ish runs. Which is good. I'll keep the long runs about this length (7.3 this morning) or so until into January, then start extending. We're going to get Christmas shopping done. And we're going to see Tron tonight in Imax 3D. Should be fun. Right now, though, my legs are kinda tired. Duh! I felt my form dipping a bit in the last mile or so, which is reasonable. I think the road surface took a little more out of me than I thought it would. My pace was spot-on, even though I was getting tired, so that's a good sign. I'll need to start incorporating some speed work when spring rolls around. I was looking at other halfs to do, to see what I could do on my own... There's the Tacoma City half on May 1st, but that's also the same day as the Mt Rainier Duathlon (a BuDu Racing event), and I imagine we'll be helping out with that one. But... there's the Tacoma Narrows half on August 6th... Tougher course (winning time last year was 1:09 and change), but I'm not really gunning for the win (my worst time ever in a half was 1:06 or so, and that was when I was in college, but my best isn't much faster). I'd like to make it under 8:00 pace though. It's a smaller event, so it may be one of those things where I'd be alone through a lot of the run. And it has the potential to be... warm. But I like the heat. We'll see. Registration for that one doesn't open 'til April 29th. So I was looking through the Born to Run forum site, and there was a link to a "new" blog "Zero Drop". And near the bottom of the page is an entry on Nike history ( http://zero-drop.com/?p=227 ). In that post is a picture of the Nike line from 1977... And front-center in that picture is the Nike Daybreak, the first real running shoe I ever wore. Actually, I went through two pair of those shoes, and put THOUSANDS of miles on them (far more than I should have, I'm sure). Wore them out completely. These shoes were built on a straight last, so straight, in fact, that you had to look at the insole to tell which shoe went on which foot until it was well worn-in. manufacturers with varied success: Reebok (London TC racers and one pair of training shoes), Saucony (Jazz, which lasted just two days, a model that was designed by Scott Tinley, and the current Kinvaras), and... Surprisingly I think that's about it. Never anything by Adidias. Just the wrong fit. So anyway, it was funny and interesting to see this post with the picture. Took me back to my young and indestructible days. I don't think I'd survive in those shoes today. But in some ways I'm more returning to my early running roots by running mostly off-road. Cross Country at my high school, starting in fall 1980. I ran a 6 miler yesterday. The weather gods were smiling on me (they have all week). Afterwards, my lower legs (shins) were feeling it a bit. Not painful, more like a tightness. Still here this morning a little bit, but I'll be taking it easier today, and be back at it tomorrow. After three days in a row of running it felt good to take an easier day MTB riding. Did a normal route, just cruising along. Typing this again... ended up deleting it before posting. So I did a long-ish route this morning at 7:30... 27 degrees out. I took Jake with me, as he needed the energy drain. So I ran 5.73 up through Pierce College and around Bradley Lake Park (but not around the lake). And it was one of the worse runs. Not because of how I did physically, or the cold, or anything like that. It was Jake. Shying away from EVERYTHING! Cars, traffic cones, sign posts, fences, balloons... Add in about a dozen people walking their dogs on the campus, Jake dragging me through mud and soaking one foot (with over 2 miles to go), and I was just NOT a happy runner. Okay, so I made it three days in a row running, with no ill effects. Now I've finished two days off, and will do another three in a row running, and see what happens. I mapped out another "long run" route that is simpler -- around Sunset. Just over 8 miles, with almost no hills. I think that'll be a better route for a first long run. Where is this going? Not sure.